If you have ever gone shopping with one or both of your parents, you may have seen them pay using a plastic card instead of dollars and coins. You may have had questions, such as “What is that plastic card? Is there money in there? Can I have one?” This article will help to answer your questions about these things known as credit cards and debit cards, and explain the differences between them. Cards are sometimes used instead of money in order to buy things. There can be various reasons to use cards instead of normal money. It is much easier for both the person paying and the person being paid when a card is being used. With a card, you just need to scan it and the person will be paid. When you use money you need to count how much money you have and then give an amount close to what you are paying the other person. Then, if you gave them too much money because you didn’t have the exact amount you needed, the person being paid needs to give back the extra money you paid them. Also, cash can be lost or stolen. We talk later on about how cards can protect you from that. 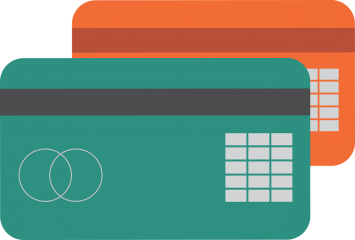 It’s important to know the difference between credit cards and debit cards. These two are used in similar ways but they are not the same at all. A debit card is connected to the banking system to your bank account. When you buy something with a debit card, money is automatically taken from your account and given to the account of whoever you bought it from. With a credit card, on the other hand, you are basically borrowing money from the bank when you make a purchase, and that borrowed money is used to pay the store. You are then expected to pay back the money you borrowed within a certain amount of time, usually 30 days, but this can be different from card to card. In addition, the bank will also ask you to pay them “interest”. Interest is what you pay the bank to say “thank you, for letting me borrow the money”. Getting a debit card is very easy. This is because a debit card is really just a way to get your own money from the bank that gave you the card. Most of the time you get a debit card when you get a bank account to keep your money in. A credit card, on the other hand, is much more difficult to get. If you have had a history of using credit cards unwisely, like if you forgot to pay the money back, then you can be rejected! After all, nobody wants to lend money to somebody who is not able to give it back. As said before, a debit card is connected to your bank account. That means you must have a bank account in the first place. Credit cards do not have this restriction, and instead they are tied to the business you got it from. Debit cards and credit cards have different kinds of security, just in case your card gets stolen. For a debit card, there is a PIN number you enter when you get the card, and which you use whenever you buy something with it. If somebody who has stolen the card (or the information on the card) does not know the PIN number, they will not be able to use it. However, if the thief is able to get your PIN number, then you will have no choice but to report to the bank, and as this investigation takes time, you can end up losing a lot of money. For a credit card, there is no PIN number, the law protects you from losing a lot of money if it gets stolen. You are not responsible for more than $50 of purchases that were not actually made by you on a credit card. A debit card can still be more secure as long as you keep your PIN number safe. With credit cards, there is a risk of spending more money than you will be able to repay, which does not exist for debit cards. This is because debit cards take money from your bank account so you can’t spend more than you have. While credit cards keep lending you money each time they are used. Now that you know the differences between debit cards and credit cards, deciding which one will be right for you when you are old enough to own one will be easier. Now you know what is going on when your parent takes out that plastic card at the grocery store. For more resources for kids to learn about money management and financial education.